To hit a decent golf shot, you need to make contact on the center of the clubface with the clubface square to the target, and the clubhead moving toward the target. 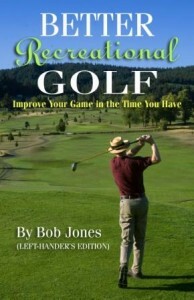 Do that and you can play decent golf. If you want to play outstanding golf, there’s one more thing. Hit the ball first, the ground second. If your handicap is in double digits, the chances are great that you hit the ground first, and the ball second most of the time. When that happens, clubhead speed is diminished before the ball is struck, causing you to lose distance. The clubhead can get twisted, affecting accuracy. The most effective strike is to hit the ball before the clubhead reaches the bottom of its arc. This drill teaches you how to do that. Fold up a bath towel two times, so there are four thicknesses of towel, and place the towel about six to eight inches behind the ball. Now hit 9-irons without brushing the towel on the way down. When you do, the ball leaps off the ground with what seems like no effort on your part. That’s the kind of shot you want to be hitting. After you get good at this drill, you can try a more challenging one which tests what you think you have learned. 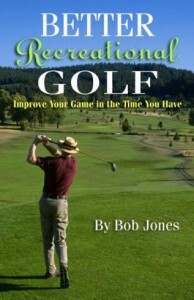 Take the towel away and put a tee on the ground so it points to the leading edge of the ball. The divot that you make with your 9-iron should start on the target side of where the tee is pointing. 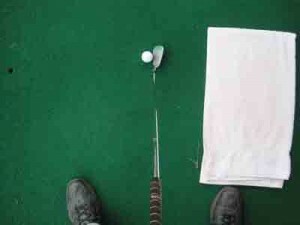 If that doesn’t happen, practice more with the towel to really get that swing pattern into your subconscious mind. The 9-iron is a good club to start both drills with, but once it gets easy with that club move to an 8-iron. Work your way through your bag one club at a time, not moving to the next one until you have mastered both drills with the club you’re working on at the moment. And I do mean “mastered.” “Pretty good” isn’t good enough. That means old habits are still kicking around. You need to practice until they are entirely gone. 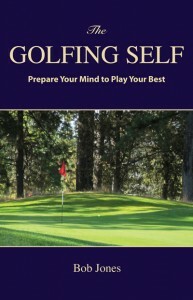 Don’t be surprised if it takes several months of steady practice to work through all your irons. Of all the instructional posts on this blog, this is the one that will have the greatest positive effect on your game. All the other tips will help you to become better. This one will transform you. You’ll be playing a different game. I’m not kidding.